British Minister for Arts, Heritage and Tourism Michael Ellis has placed a temporary export ban on a study table used by famous English novelist Charles Dickens. After being sold at an auction in December 2017, the table is at risk of being exported from Britain unless a buyer can be found to match the asking price of 88,000 U.S. dollars to keep it in the country. Estimated to be made around 1835, the William IV mahogany round table has a revolving drum top above eight drawers and is covered in green leather. It was used by Dickens during most of his career, first in his London home at Devonshire Terrace, then his offices on Wellington Street where he published a number of his works, and finally in his library at Gad’s Hill Place in Higham, Kent where he died in 1870. 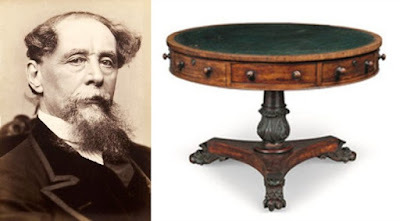 It is also known to have contained the keys to his wine cellar, and appears to be one of the very first objects to have been formally labelled with Dickens’ name. “Its associations are of considerable interest to lovers of Dickens’ novels and writings,” said Christopher Rowell from the cultural reviewing committee. Dickens who was born in Portsmouth on 7 February 1812, died on 9 June 1870. He was the greatest novelist of his era. Among his works were Oliver Twist, Great Expectations, A Christmas Carol and a Tale of Two Cities. The latter book, published in 1859 , set in London and Paris, is his best-known work of historical fiction.